allery is all about finding and displaying the best social media content. For your events and at your venues, it will be a beautiful social media wall and display; on your websites and in your apps it can be used as a sleek and trendy social media hub. Wallery is built to be versatile. We recognize that every brand, event or an individual are different. Unique. Inspired by this uniqueness, we wanted to create a product that would allow you to aggregate social media content and visualize it in a number of different ways. In fact, that is how Wallery got its name – as a combination of “Wall” and “Gallery”. Unlike other products and services on the social media wall display and social media hub market, we offer a unique experience and allow for powerful customization and making sure that each and every Wall is uniquely yours! Wallery is a new product but its history goes back to Wall Of Tweets – world’s most loved twitter wall solution. We’ve been running Wall Of Tweets for over seven years and have learned a lot from thousands of our customers. Based on that experience and a lot of research and development, we created Wallery. With Wallery you can discover, curate and display the best social media content and related conversations at your events, venues or in your apps or websites. We are a small but an incredibly passionate team that started working together as a part of UX Passion, a full-service UX design agency headquartered in Europe with clients from all around the world. With Wallery, however, we wanted to embark on a journey where we would create a product that will be used by thousands upon thousands of happy customers. All nine of us worked very hard on building Wallery. From product conceptualisation and customer development, through prototyping, interaction and UX design, visual design – to development and testing. 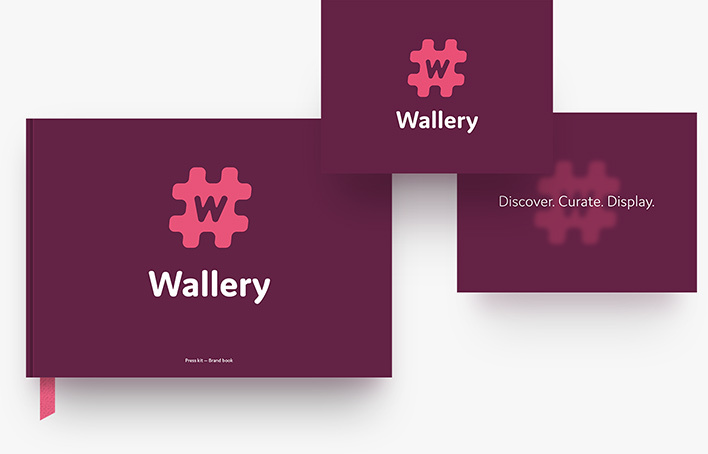 Wallery is truly our brainchild, and we are incredibly happy that you are now able to try it out for yourself. We welcome your feedback, ideas, and suggestions. Feel free to send them to [email protected]. We promise to do our best to reply to you as soon as we can! In this bundle, you will find a .pdf document with basic guidelines for implementing Wallery branded materials, logos, visuals, etc. For digital use and print.